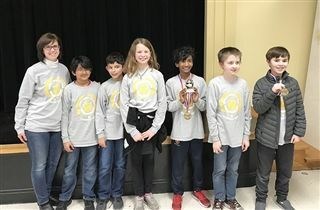 Congratulations to the fifth grade Governor’s Cup team, who was recognized with the Hume Sportsmanship Award at their regional competition on March 2. In addition, Ashir Ouseph placed 5th in Arts and Humanities, and Gage Fackler placed 3rd. Congratulations to these Bearcats on exemplifying our motto of Citizen, Scholar, Steward.